In addition to the high quality and diversity of their ever expanding fleet of freeware classic airliner simulations, the folks at Historic Jetliner Group are also known for the frequent surprises they like to make to the FS community. This year, as in previous years, the HJG team has prepared a wonderful Christmas present for their fellow virtual pilots, and they've just placed it under the tree for us to grab it - a set of 737 Classic series simulations, as well as a brand new, advanced Dassault Mercure simulation by Mario Noriega, offered through HJG. The 737s are as cool as they can be, but I personally find the Mercure simulation to be even more spectacular because...I mean seriously...a highly realistic simulation of an exotic, rare and easily forgettable aircraft from the past, is bound to be spectacular! As soon as I get time, I'll sprint for the virtual tree to unpack this present, I suggest you do the same! If you do, I wish you loads of fun with these new birds! 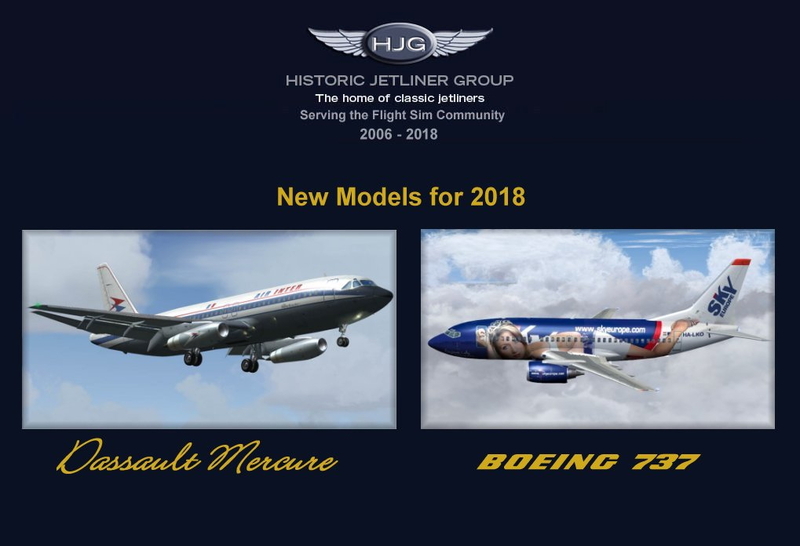 A full year of intense effort spent on the 737 simulations, another 2 and a half years of equally intense effort spent to bring the Mercure project to fruition...just to offer them for free, like all the other goodies available at HJG...this truly is a wonderful Christmas present! Thank you HJG! Click on the pic to go to the announcement.